I have been thinking about wet tumbling for a year. I like the results I have seen, but the cost seemed high. Last weekend I had a chance to examine a Frankford arsenal wet tumbler. Tonight I found it on sale with media included at cabelas for $149 with an available coupon for 10% off and free shipping. The total price was $135 shipped. I figured that I would let the rest of you know. The tumbler will hold 500 45 cases and cleans them in about 3 hours. It has a timer built in to the unit. No, but I have tested between dirty used mixed brass vs. brand new starline and in my stock springfield, both were able to produce 2.75" groups. I found that errors with the rest brought bigger groups than brass does. When I used to tumble with primers in, I would get dirt and other dry media stuff all over the press. That stuff causes primer feed problems in my Dillon and indexing problems with my Lee progressive. I find that when I wet tumble, I save a ton of time and money by having fewer breakdowns and less cleaning of my presses. When I reload, I make really big batches and not having to clean all that gunk all the time is preferable to me. my personal experience with multiple types of rifle disciplines(other than benchrest) is that cleaning primer pockets is way overrated as far as accuracy is concerned..
don't see why is would be different with pistol cases. Second batch of 500 in the tumbler. These are 35 year old WCC from an estate of a local shooter. My method is to first gather around 500 cases, by volume this number fits into a small container from the Dollar store. I then use a Lee hand press with a Lyman universal decapper die to deprime the cases. I can get 20 per minute done when I am moving. The only issue with this is that the Lee hand press has a closed spent primer tube that must be emptied every 30 round. A little earlier I deprimed 500 cases in less than an hour (about 45 minutes including the time spent dumping primers). As each case is deprimed it goes into another plastic container and when that is full, I go out to the tumbler and mix 500 brass with a squirt of a Dawn and 1/2 teaspoon of Lemishine. I fill the tumbler with warm water, dry the outside and start the machine. The first batch I ran for 2 hours. This old brass I am running for three. Next batch I will try Rob's car wash solution method. I have some here with wax in it. Send us pics if you can. I know it doesn't make someone shoot better but it sure looks a lot classier all shiny and new looking. What do you use to dry the cases? Chicken wire? Virgil Kane wrote: Nice ! 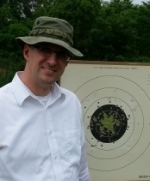 In rifle shooting I always thought having clean shiny brass helped me to find and recover what I had shot. If everyone starts cleaning their brass up so well I may have to color mine black to be able to pick it out! No chicken wire! though it might work? I just use a couple of towels in 2 cheap aluminum roasting pans. The brass dries in the utility room in a day or so. It would be faster outdoors, though. JayhawkNavy02 wrote: What do you use to dry the cases? Chicken wire? Like jmdavis, just spread out on an old towel and let dry. If spread out in the summer sun outside the brass will be dry within an hour. I did that yesterday and with the temperature only in the high 60's it dried in an hour. Inside I have an old computer fan rigged to blow air across the brass overnight as it's spread out on the towel, it's dry by morning. Some people have gone through the trouble of making a drying box with a light bulb inside and an old computer fan to blow the air around inside. I find that unnecessary because I don't prep my brass and load in the same day (or week for that matter) but could be fun to try and build a better mouse trap. 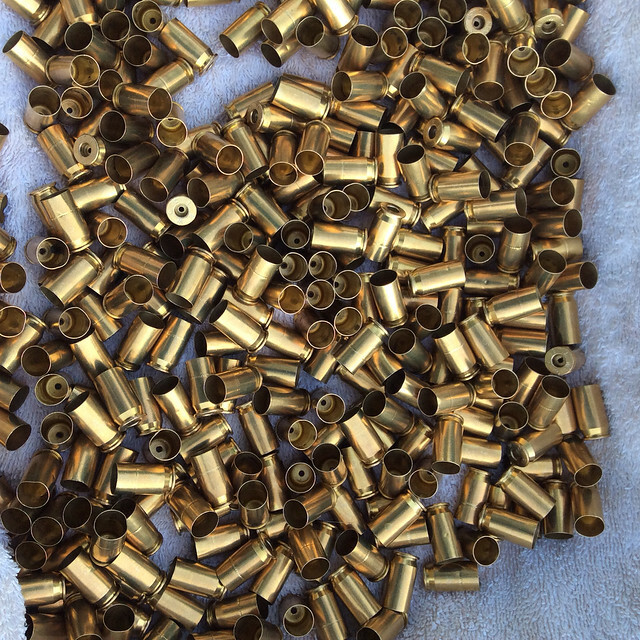 I don't wet tumble but often wash brass I pick up at the range. I wash it in a lingerie bag (really!) and after rinsing just hang it over a line strung up in the basement. After a few hours, toss the bag around so any cases standing upright (and thus full of water) get turned over. The next day they are dry. Might work as well for wet tumbling? For those that don't have SS pins you can try this to make your brass shiny like new. If you tumble in corncob or walnut shells when your done the brass is clean but still has some tarnish and doesn't look like factory new, kind of a dull shine to it. Empty your tumbler of media, full 1/2 way with water and put in a tablespoon of Lemi-Shine and your media polished brass, seal it up and tumble for an hour. Brass after tumbling for an hour should be much cleaner looking and a lot more shiny that from tumbling in corncob or walnut media. The citric acid in the Lemi-Shine will make your brass shine like it's brand new. You don't need the SS pins, all they do is knock out the debris and carbon. It's the citric acid that makes brass shine. only use a tiny amount of lemishine....it will turn your brass pink if you use too much! Rob Kovach wrote: only use a tiny amount of lemishine....it will turn your brass pink if you use too much! Rob, I've been using a tablespoon of Lemi-Shine for the last 4 years and have never had my brass turn pink nor have the others in my club that use Lemi-Shine. It could be that there is something in either your water or mine that makes different results. I'm using city water from Lake Michigan. Maybe water from a system with a water softener or some other chemical additives would turn the brass pink from a chemical reaction. As an experiment this last weekend I tried using only 1/2 teaspoon (as per your suggestion of using less earlier in this thread) of Lemi-Shine, Dawn dish soap and tumbled for 4 hours (I know you tumble for less time). I wish I would have taken pictures but when done after 4 hours the brass was very dull, clean but dull. I then yesterday tumbled in the water Lemi-Shine solution and after an hour they were shiny like new. I can't explain the differences you and I get but all I can say to the wannabe wet tumbler is they have to experiment to find out what works for them. It's obvious that what works for me doesn't for you and vise versa. I use dawn and a 1/4 tsp of lime shine then run them through the separator to remove pins and water then put them in corncob with a little polish for 30 to 45 minutes and they are shiny and dry and seam to go through press easer with just a little polish. I drank the 'kool-aid' and got a wet tumbler, tried it for the first time this afternoon and the results look good. I apparently need to get my rotary sifter back (loaned it and a vibratory cleaner to a friend) as shaking/agitating the drum in a bucket was less than efficient or fun. How come no one mentioned that it made more noise than a cement truck? I bought distilled water to use as my home water is acidic enough that it eats copper pipe (leaves the solder joints though). A couple gallons for cleaning isn't a big deal but needing 4 more for rinsing might become one just in needing to buy, transport and store it. Many of you don't seem to have to deal with below freezing temperatures but they move this kind of project inside rather than in the garage for much of the year. I used the cleaner/soap that came with my FA tumbler for my first test (about 400-500 5.56 cases that had been resized and still had case lube on them). They came out great! Being a cheap yankee, I tried saving the cleaning water/soap (mostly because I did not have any more to use) and running the second half (another 300 or so) of that lot of brass in it. After 3 hours it was pretty clean and no longer greasy (from using Imperial sizing wax) but not remotely close to the 'new look' of the first batch. I can live with that, I will finish processing (trim, deburr, ream primer crimps) and run it again with some car wash soap which is on tomorrow's shopping list. I know, 'everyone' has car wash soap in the garage but after decades of washing fire trucks I don't wash vehicles any more! So far I can't say that the results are easier than dry cleaning with a vibratory cleaner but the results look good and the lack of dust is great! I appreciate the advice on different things to try as cleaning agents. more experimenting to do. Never heard of 'Lemi Shine' before but I will have to look for that as well. Lemi-shine is a soap for automatic dish washers. I get mine at Target stores. If you have problems with a "sticky feeling" when re-sizing you can always put the brass in a bucket and give them a small blast of "One Shot" from Hornady and give them a good whirl. 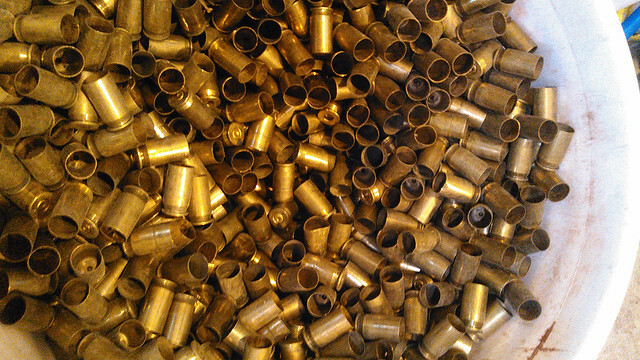 A couple more batches of brass cleaned, still trying out the various suggestions for 'cleaning solutions'. My local auto parts did not have Meguiar's but had Mother's yellow soap with carnuba. Wife was headed to Target and brought home some Lemi-Shine. I tried just the Car wash and brass came out very clean but not all that shiny. A little Dawn and just a touch of Lemi-Shine (probably not enough) was similar. I did not see where it was recommended to use the car wash along with the Lemi-Shine (although I probably just overlooked it), so far that is the winning combination for me. I also experimented with using my, very acidic water rather than the distilled, no discernible difference with that. With the days getting colder and time outside becoming less desirable, this is a fun 'side track' to actually shooting! Anyone tried hot vs. cold water to see if that made a difference? Thanks to all for the patient advice. I use hot water from the tap. Rinse with cold.